Retro review, Hmmm! What’s this? What’s this! Well it’s a retro review, that’s what and possibly the first of a few. The point, well I would have thought that was obvious. Since 19-0-dot people have been churning out slot cars (if you believe what you read on the internet). And some of these cars, believe it or not are actually good, yes you heard it right! Now this sort of retro may not appeal to those who rebuild their cars from the ground up on acquisition but should certainly appeal to the newcomer/collector/racer who like to have a broad spectrum of cars for his own delectation. I know it is true that even amongst the most avid racers there are those who have their ‘pet’ cars that in a quiet moment, with a glass of red wine or port (or butterscotch schnapps and a tinnie). Who like to take stock and reflect on former glories with some historic equipment? Now you may ask why is the Scalextric JPS BMW M1 more valuable than the Scalextric Donatello Ninja turtle on a skate board! Especially when there are probably 20 times more BMW’s? Well. The answer is the BMW looks the biz and drives amazingly well! Surprise, surprise! 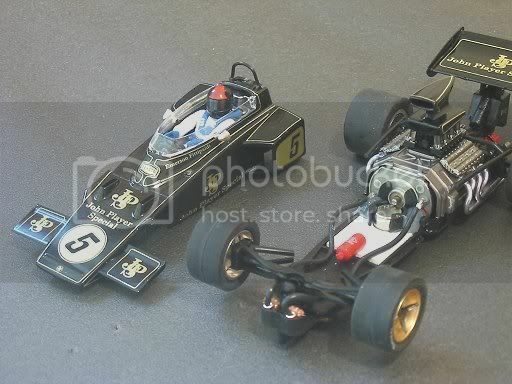 So my endeavours are to pick out some amazingly good and some crashingly bad cars for review so the younger ones amongst us can trawl through ebay with confidence and obtain some of slot car racings ‘Classics’ without doing their dough on a dud. So without further ado, lets get on with the show. 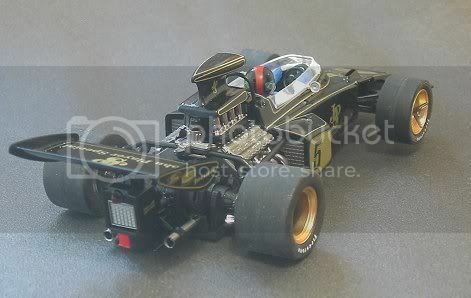 My first choice is not really that old but the reason for choosing it is that it is a deceptively stunning model, it is now starting to appear on ebay as a resale item, there are a few left in retail outlets at reduced prices AND the manufacturer has recently announced it has suspended its new model program! On opening the box the first words uttered where ‘WOW’ and ‘Oh my God!’ This model was built to stun. 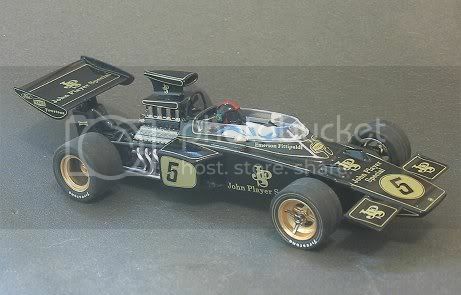 The JPS livery has adorned many a racing car of various persuasions and in my view is probably the most eye catching of all, even better than the myriad Golf liveries that have recently appeared. The tampo is first class as would be expected of a model of this price and it’s positioning is almost faultless. But, either the black or the clear coat lacquer lets it down, there is severe ‘orange peel’ on the oil cooler housing below the rear wing and around the vents on the nose above the front axle but to top this there is a very pronounced paint/lacquer run on the left hand side pod ! One of those that pulls your gaze back to it time and time again. So, moving on, wheel detail, beautiful, but are the real spin-offs that big? Mock wishbones look good, tyres are well marked, engine detail, some of the best seen for a long time. You get the full exhaust system, rear mounted oil cooler, a dummy rear light and even a separately moulded battery in bright red! Other details like rear view mirrors, dash gauges, driver detail are also to a good standard. VMG have also gone to the lengths of making and fitting a fire extinguisher under the driver’s legs. This is best viewed with the body removed! The driver is Fittipaldi and the helmet carries the Brazilian flag. Apart from all this, another disappointment was the quality of the screen. Sides were great but the front was cloudy as if Superglue had been applied. Once over the extended study of this sublime detail, other factors start to call. i.e. Does this car go? I must admit, I put it straight onto the (board) track. 21 metres with four good straights. 45 ohm Parma economy. (I decided against plastic track to start with for reasons that follow later). I wanted an honest out of the box impression. Well, out of the box wasn’t too impressive. The motor has plenty of grunt and it was obvious that the tyres were going to need some attention before this wild child was going to impress. It traversed the straights at about 20 degrees to the slot and flicked back violently on braking for the bends. Corner entry speed was good but was hard to define with its antics under brakes. So now to prepare this car for a board outing to talk about. Firstly tyres! I took the tyres off the rims and lightly sanded them on a dummy axle. 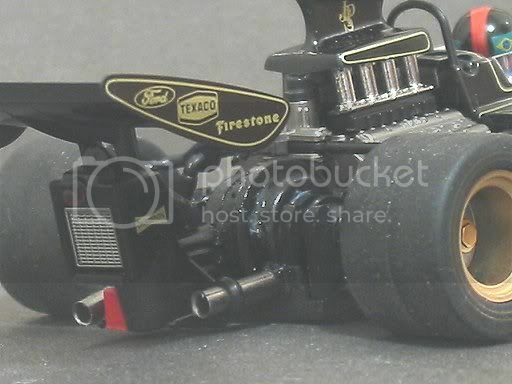 Reason being that this car has a tiny differential built of plastic! The very act of truing these tyres up on sand paper by running the car and plonking it down ‘til the things start to take shape will almost guarantee damage to the very fine internal sun and planet wheels! If it doesn’t fail then, it won’t be long on a magnet track with the amount of down force the Ninco like button traction magnet in front of the motor imposes. So, having taken most of the rough edges off the moulding I inspected the wheels. Moulding flash at the injection points had to be removed and worst of all, the left hand rear and right hand front wheels were out of true, even wobbley! quite noticeably! Not good at this price! 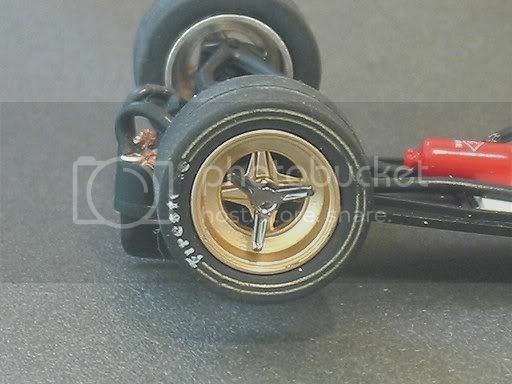 The rear axle/diff set up is quite revolutionary and potentially has an advantage with magnet racing, but on a board track it is academic as the car will corner with sideslip and not run the diff. While giving the final drive a going over I took the rear axle out and separated the diff. carefully revealing the gears. There was some lube inside but having read horror stories on the message boards and forums I decided to fill it to capacity with petroleum jelly (“Vaseline”) This is pretty inert and has good lube qualities on most plastics. Reassembled it was a bit fiddly to get back into the clips. So care is needed. Excessive distortion of the axle line on re-insertion can, in my view as an engineer, be fatal! One other word of warning. NEVER, I repeat NEVER hold one wheel while the motor is running at all. The other wheel will run up on the diff. The delicacy of these parts cannot be overstated and it will be tears before bedtime! This car runs on its guide and a good guide it is too, reminiscent of the Ninco guide, the power is taken to the braids and the braids fixed by a pair of eyelets on the lead wires. The guide has a full 6mm depth and side play is almost non existent which accounts for its good corner entry and braids are medium soft copper. Time to remove the body and a single screw behind the guide facilitates this. It’s here that another QC problem arose. 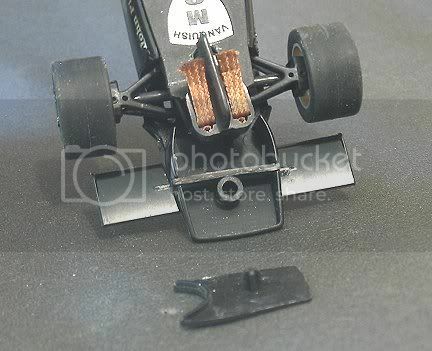 The rear end of the cockpit bodywork clips over some fittings on the chassis, just in front of the exhausts. For some reason, the body flex allows these clips to unfasten for no reason. I eventually had to epoxy some extended body side clips to stop the body ‘popping’ up at the rear! 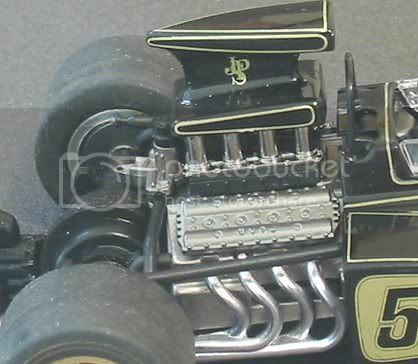 The engine detail clips in a similar fashion over the motor. This seemed to fit snugly, and having no reason to check out what was underneath, left it alone. Another thing spotted but no warning anywhere was the front wing. Believe it or not, both front wings are attached to a central mount by 5/64” diameter plastic injection moulding. This is smaller than an axle diameter (3/32”) I looked at amazement at this and decided that it would be ludicrous to drive this car any further with the wing in place! Fortunately, buy design or accident, the nose has a separate filler piece, carefully levering this out will allow the removal of the front wing without removing the body. Once again I recommend that the front wing be removed EVERY time this car is put on the track. It’s life will be measured in minutes if you decide to race with it in. So after a lube job and a bit of tyre truing, (pity about the wheels!) it’s time to retest on timber. As mentioned before, the motor is not short of grunt and on the average 25 metre track will be more than a handful. The car demonstrated a lot more grip than previously but still had a slight sidestep on take off. The tyres were treated with silicone lube (WD40) and dried, the car was then transformed into a projectile and take off and cornering with what looks and feels like natural rubber tyres was a vastly improved. The model looked very impressive rounding the sweeper and out on to the main straight without so much as a twitch. Engine braking is good and on wood will pull up quite smartly from the greatest speed. There wasn’t any evidence of heat fatigue in the motor and it was run for 15 minutes or more. The tyres went off slightly the longer it was run but it still accelerated and cornered respectably at this. It was good to run it after so many potential disaster signs were noted during the inspection. Firstly the diff would have to go. Up ‘til recently people have been rigging up Ninco gears and motors but I have recently seen VMG regular axles for sale on some of the Internet slot shops. This should make life easier as I believe there is a discrepancy in the dimensions between the motor and axle mounts which make a straight swap over into Ninco or similar a bit difficult. The VMG motor has the pinion mounted hard against the rear motor bearing and there is no spigot to run in a normal contrate’s aligning slot. If the wheel distortion is prevalent then it pretty well excludes them from racing, therefore it would benefit more from proprietary alloy wheels and either Indy grips or Ortmans. The front axle is a floating rigid type but not only does it float up and down, it floats back to front too. Almost as if it were steering. This didn’t manifest itself as a problem but it may need to be fixed for serious racing. Once again, even with the imperfections, this car is a beauty. To the scale man it is a bit bigger than 1/32 but not much. 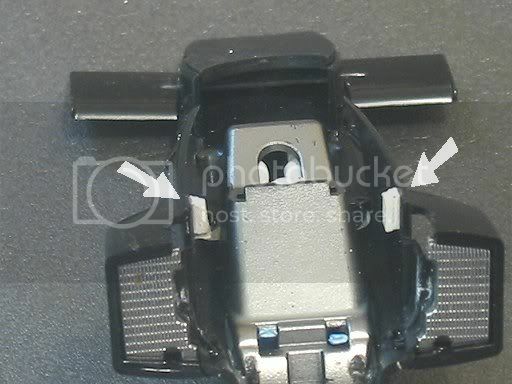 The major scale fault is the rear wing which is mounted too far back. Probably to give access to the notorious diff. Tooling and R&D for this model must have run into many tens of thousands of Euros. So many parts, such intricate moulds. It beggars the question ‘has this sort of engineering been the cause of VMG’s current dilemma. So, I’m quite happy for this to sit in my study and adorn my little palace. I will give it the odd run now and then but always on a timber track and always with the perishables removed, why? Because it’s most unique feature is not up to magnets on plastic tracks. Replacement axle? I won’t bother. I have plenty of other cars I can tear the A**E out of if I want. I’ll wait until someone else produces a proper racing version. I’m sure Hornby Hobbies will have one in the pipeline somewhere in the next ten years. This is a classy car, but it’s NOT a slot car!